Girl.Bike.Dog. creates messenger bags, backpacks, side-bags for dogs – all with super-kawaii, urban street designs featuring trippy mushrooms, clever cosmo cowgirl symbols & iconic girl graphics. Lindsay Duggan tells DoN she’s working hard to meet the demand for Girl.Bike.Dog. gear. 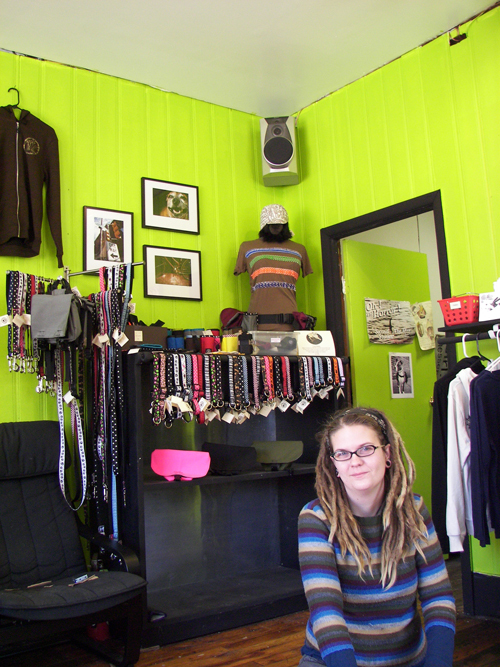 The shop offers T-shirts by various artists, cycling hats, knit hats, uber- cool dog collars & leashes and essential bike gear. Photography by Center City West photographer/dog walker, Jeremy Burger of The Philly Pack – the ubiquitous Center City West dog-walking service who offers high endurance exercise for dogs, social & behavioral conditioning and Pack Leader coaching. 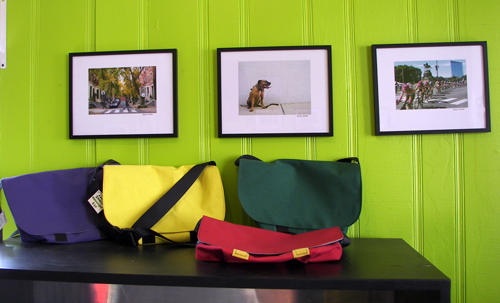 Messenger bags by Girl.Bike.Dog. 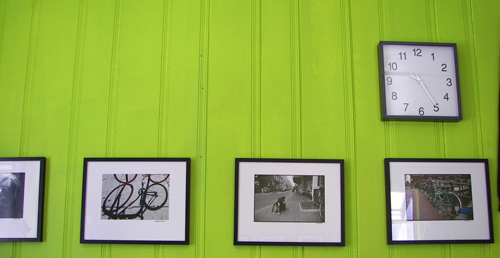 The bike and messenger community in Philly is tight-knit and owner Lindsay Duggan is knowledgeable of the needs of the biking enthusiasts, urban dog lover and fashion design lovers. Duggan is well informed about the current discussions around bike laws in the news, bike lanes in the city and the rise of human powered transportation, the perils of being a bike messenger, dog walking services and urban dog owner needs. And, she makes really awesome hand-made bags. 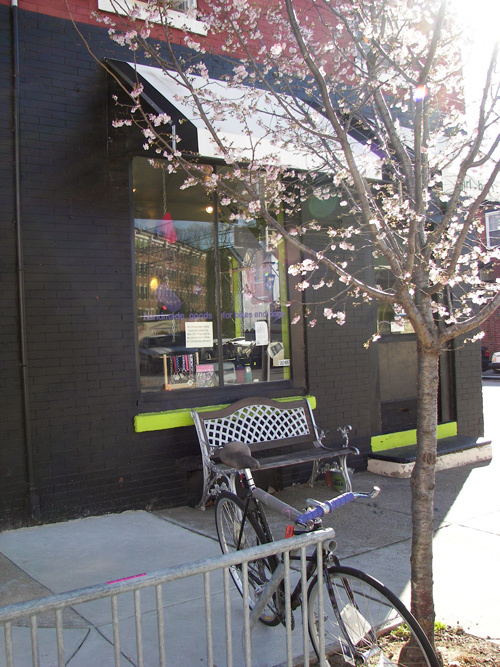 The block where the shop where Girl.Bike.Dog is located includes Betty’s Speakeasy Cupcakes (best of Philly Mag), The Balkan Restaurant with the best Serbian recipes from Radovan’s family recipes and Grace Tavern, the best fries in town. The view of Center City is spectacular, too – DoN was surprised to see the cherry trees in bloom for Indian Summer. Photography by Jeremy Burger @ Girl.Bike.Dog. Lindsay Duggan mastermind behind Girl.Bike.Dog. 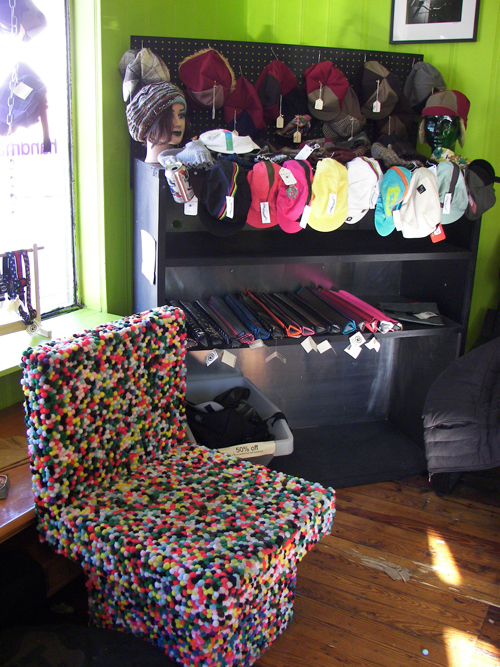 This entry was posted in Art in Philadelphia, Clothing, Fabric Art, Fashion, Philadelphia, Philadelphia Art, Philadelphia Art Galleries, Philadelphia Artists, Uncategorized on November 30, 2009 by admin1. Italian Market by Nevio Celestino @ Deptford Municipal Building. Even though Deptford, NJ is only 20 minutes from Center City by car many art enthusiasts won’t cross the bridge; DoN blames the news media for branding Killadelphia as a scary place and the Philadelphia Parking Authority will get you by hook or by crook. But the art community builds neighborhoods by going where others fear to tread and many towns have turned to artists to bring culture and art to their citizens. But it takes special people to take the initiative to make these things happen; in Deptford, Pauline Jonas has assumed the role of art curator for the Deptford Municipal Building @ 1011 Cooper Street with ongoing art exhibits by local artists, art trips to museums and movie viewings about art and artists. Recently, South Jersey’s newspaper,The Courier Post, ran a story about Jonas’ efforts and the impact she has made on the community. The current exhibit includes Nevio Celestino, John Echtermeyer, Lolly Grilli, Jerry O’Donnell, Stefani Ramberg and Lawrence A. Vassallo with pottery by Harold N. Schaeffer. 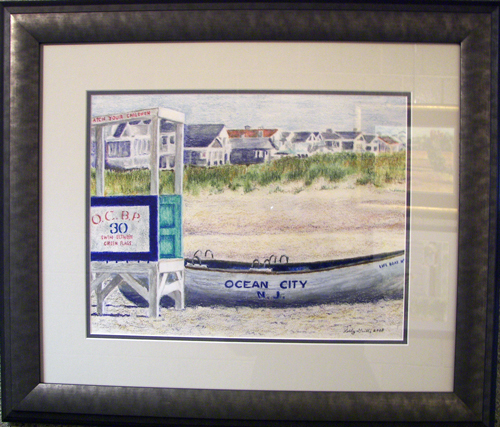 30th Street, Lolly Grilli @ Deptford Municipal Building. 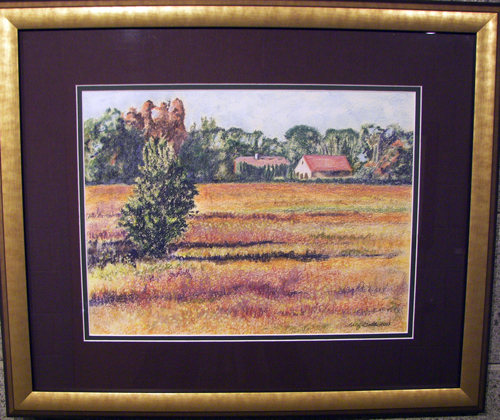 Autumn on Berkley Road, Lolly Grilli, pastel. Lawrence A. Vassallo @ Galleria Deptford. 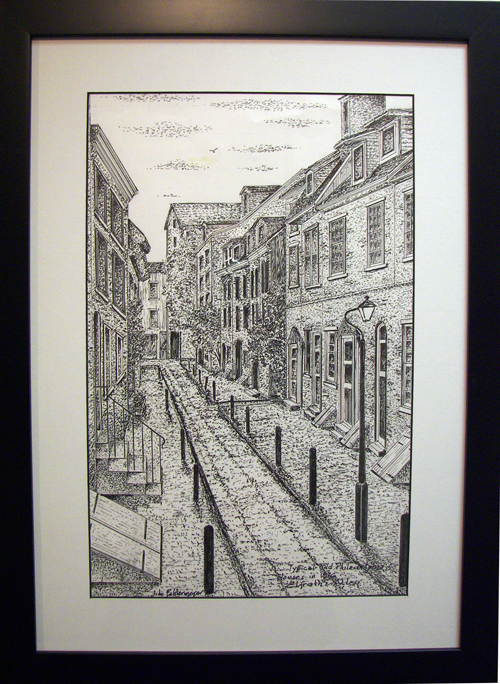 Elfreth’s Alley, John Echtermeyer, pen & ink @ Galleria Deptford. 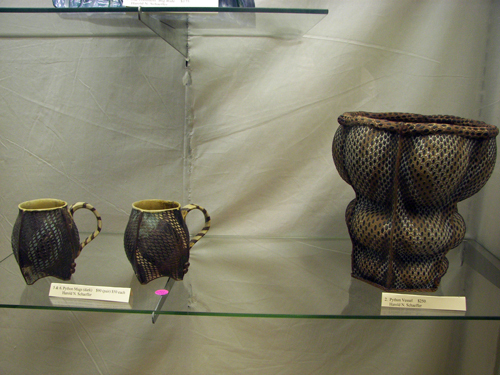 Pottery by Harold N. Schaeffer @ Galleria Deptford, Deptford Municipal Building. The current exhibit is on display for a few more days to be followed by the Annual Photography Exhibit; DoN is proud and honored to be included in the show since Deptford is his home town. Alden Cole, an art star of the fabulous Philadelphia Dumpster Divers, is displaying his Night Lights for Adults in the cabinet outside of the court room. 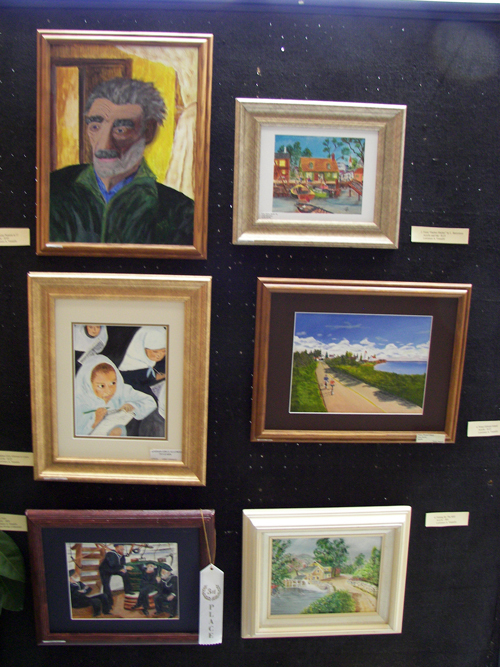 Pauline saw DoN‘s art at Alden’s gallery/museum/studio – you can imagine his surprise when he was offered a place in the show and discovered the venue is where he graduated high school in 1971 with an award for “Most Artistic“! The opening reception is Sunday, December 6th, 2 – 4:00 PM. 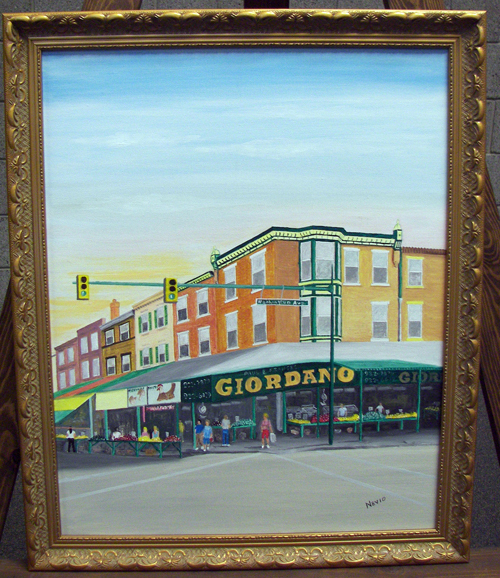 This entry was posted in Art Spaces Philadelphia, Drawings, Folk Art, New Jersey artists, Paintings Philadelphia, Pastels, Philadelphia Art, Philadelphia Art Galleries, Philadelphia Art Installations, Philadelphia Art Shows, Philadelphia Artists, Pottery, Public Art, Uncategorized on November 29, 2009 by admin1. 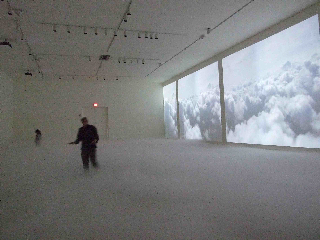 Su Tomesen‘s extraordinary video installation, 40,000 Feet, in the Ice Box Gallery @ The Crane Arts Center has been extended through 11/29/09. 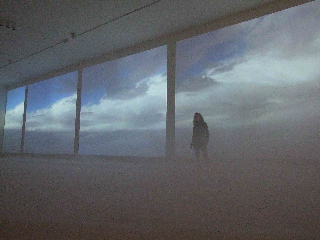 The multi-screen movie is a visual and sensory exploration of the sky as viewed from above, take time to visit the show which originally was to close yesterday due to the upcoming holiday. Photos courtesy of Su Tomesen. 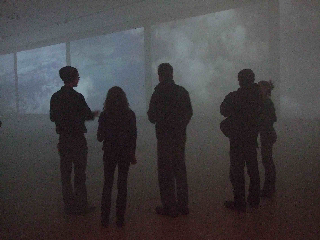 This entry was posted in Art in Philadelphia, Art Spaces Philadelphia, Da Vinci Art Alliance, Light, Multimedia Art, Philadelphia, Philadelphia Art, Philadelphia Art Galleries, Philadelphia Art Shows, Sound Design Philadelphia, Video on November 24, 2009 by admin1. David Guinn & Jim Hinz, Hairy Chinese Landscape @ University City Arts League Gallery. Recovery, Psychedelic Birthday @ Facing the Void, works on paper @ University City Arts League Gallery, Jim Hinz & David Guinn. Purple Sandpiper, David Guinn. David is famous for his bird paintings whether you know it or not; as one of the most popular muralist in Philly he almost always includes birds in his wall paintings such as the Four Seasons series, the Morris Animal Refuge Mural and the dual mural @ 34th & Baltimore Streets. Jim Hinz, Because You Have To Say It, digital print. Jim Hinz, The Big Man, digital print from brush & ink on paper. Mythical Mountain Fountain by David Guinn & Jim Hinz echoes the collaborative paintings the duo created including architectural elements, blobby swirls and real liquid dribbling wetly over the ceramic bowl as if one of their paintings materialized fully formed out of their imaginations. Jim Hinz & David Guinn @ the opening of their collaborative exhibit, Meadowlark, @ University City Arts League. The team worked well together because they made no mistakes, felt free to experiment and fail – a lesson we can all learn from. This entry was posted in Art in Philadelphia, Art Spaces Philadelphia, Murals, Paintings Philadelphia, Philadelphia, Philadelphia Abstract Art, Philadelphia Art, Philadelphia Art Galleries, Philadelphia Art Installations, Philadelphia Art Shows, Philadelphia Artists, Philadelphia Artists, Philadelphia Sculpture, Prints, Uncategorized on November 23, 2009 by admin1. Ralph “Ren” Dillard, PAC, oil @ Smile Gallery curated by Lilliana Didovic. Ren Dillard, Blue Smoke, oil. Ren explained to DoN that he is finally finding his voice in painting, a spoken word artist (he has promised to perform at the show’s closing on 12/7), his art is about meditation, human commonality, promoting nationalism and personal pride. Dillard’s work has a defined narrative concerning urban life and cultural icons but is also searching inward to find peace through meditation, introspection and transcendental non-judgmental. Ralph “Ren” Dillard, We Are One, oil. From hip-hop heroes like 2Pac to inner dream-scapes, Ren’s painting seems to be searching for truth, justice and the New American Way. The trans-cultural tribalism of the city and the struggle to remain calm in the face of the storm is certainly reflected in the dichotomy between thug life and the art of living well. Ren Dillard, Ren’s Labyrinth, oil. Vichaya “Win” Mukdamanee & Ralph “Ren” Dillard – Mysterious Lines @ Smile Gallery. The tableau of two artists from opposite sides of the world bouncing ideas back and forth with the urban pop aesthetic of Ren’s paintings and the abstract expressionism of Win’s prints is a synopsis of contemporary culture. Win’s bold, architectural black and white prints are a striking counterpoint to Ren’s wildly colorful meditations yet the conflicting styles reflect a youthful, modern perspective of the world. Win Mukdamanee, City Element # 4, print 3 of 8. Win Mukdamanee studied art at Suankularb Wittayalai School in Bangkok Thailand (with Smile Gallery’s owner, Ken Tutjamnong’s, former professor) and is now pursuing his Master’s degree at Pratt Institute in NYC. Primarily a sculptor, Win’s prints certainly exude an architectonic flavor yet are painterly, vibrant and fluid. Mukdamanee quickly applies ink in splashy yet controlled strokes on plastic film then runs in through a press on beautiful papers, then frames the resulting image in quiet white mats. Vichaya “Win” Mukdamanee @ Smile Gallery, 22nd & Chestnut Streets. Frankly, it was difficult for DoN to get good photos of Win’s work since the black under glass reflects back the photographer, all the more reason to visit Smile and contemplate the juxtaposition of styles which curator Lilliana Didovic has so capably displayed to both artists advantage. This entry was posted in Art in Philadelphia, Art Spaces Philadelphia, Fine Art Philadelphia, Paintings Philadelphia, Philadelphia, Philadelphia Abstract Art, Philadelphia Art, Philadelphia Art Galleries, Philadelphia Art Installations, Philadelphia Art Shows, Philadelphia Artists, Philadelphia Artists, Prints, Uncategorized on November 22, 2009 by admin1.